I spent last weekend with my adopted Atlanta family. They “adopted” me years ago when my parents had moved to the West coast and getting home for the holidays proved difficult. The first time I went home with Meira was Rosh Hashana. I met the family – Monica, Caroline, Micah and relatives from Montreal – over dinner. A dinner that included simanim – eating symbolic foods to represent hopes for the coming new year. A dinner served on three tables that snaked around the dining room. (You know how much I like snaking tables for the holidays.) A dinner that included so much food and so many guests that it had to be served buffet style in the kitchen. At that point, I knew I was part of the Katz family. Over the course of the next few days, we had lunch with Roberta and Allen, Leslie and Chuck, and countless Atlanta families who have welcomed me back into their homes and their community many times since. Over the course of the next few years, the Katz family grew, and I’ve joined in for many of their simchas (celebrations). First Caroline met Randy. Natanel soon followed as they purchased a house just a few blocks from Monica. Then came Eden with those long gorgeous eyelashes. Then Micah met Eliana. Meira and I visited them out in San Francisco last year. 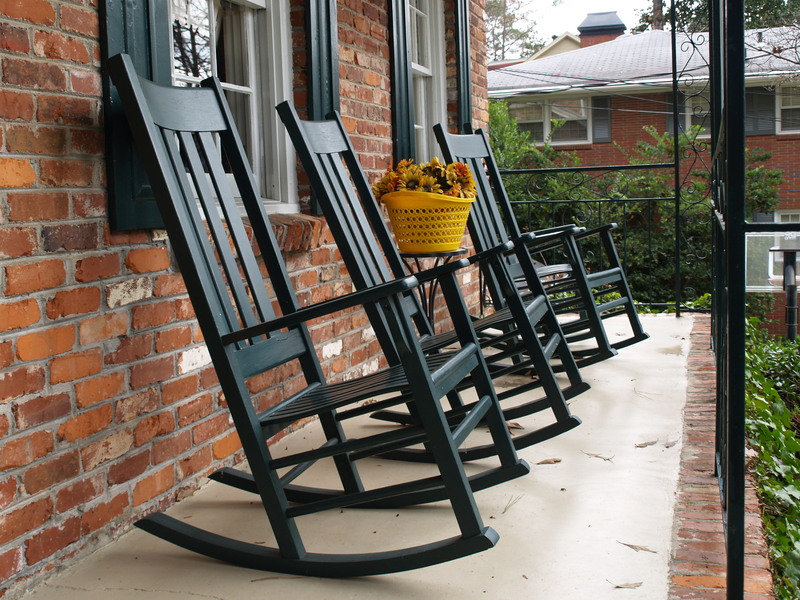 Amanda Lynn and Chipper Jones rounded out the family. Caroline and Randy bought a mini-van for this growing brood. The kids got nicknames. For a few months each, I called them Monkey and Duckie after the stuffed animals I bought when they were born. But, leave it to the Katz family – they are a family of nicknamers. Nanz and Shaindy quickly emerged. As Nanz grew, everyone around him got new names. Monica became Maman. Caroline and Randy became Mommy and Abba. Meira became Dodah. Micah and Eliana became Uncle Macah and Auntie Ana (with the British pronunciation of auntie, not the American “antie”). Deborah became Dodah Deba. This trip, I became Dodah Gayle (though I’m still pushing for Tante Gayle). Natanel also started calling me Miguel — I’m thinking he means My Gayle, and I’m cool with that. As a birthday gift to Maman, I offered to cook shabbat dinner last week. Well, that’s not entirely accurate. When she heard I was visiting, Monica (I’m still getting used to calling her Maman) emailed me immediately to ask if I would cook for her and the family. In the days leading up to my trip, she and I emailed back and forth to decide on a menu and prepare a shopping list. Mere hours after my arrival, we went grocery shopping. For fifteen people. That’s right, fifteen family members and guests would grace our table that Friday night. I’ve never cooked for that many people in my life. We filled a giant shopping cart at Kroger. We bought over 8 pounds of mushrooms (that soup recipe will follow in a few days), 3 bunches of red chard, 10 pounds of potatoes, 4 heads of cauliflower, and on and on. While I’m mentioning Kroger, let’s talk about their in-house (kosher) butcher for a moment. When he saw the two of us pondering the ribs in the refrigerated section, grumbling that they were not quite what we wanted, he approached and asked if he could help. I explained what we were preparing and that I needed thick short ribs – about 2-3 inches of bone – and cut in one or two rib pieces. He returned with a piece of meat, cut to my specifications, asking if it was OK. It looked great. He then spent the next 30 minutes while we filled that giant cart, cutting and packaging the meat exactly the way I wanted. I might actually consider that this year’s Hanukkah miracle. While on line, Monica sent me back to the butcher to pick up a few more pounds of short ribs (again, exactly to my specifications). At this point we had north of 13 pounds of ribs. I can say for sure that I have never had that much raw meat in my posession in my life (though, I did once come close). We got home and I set to work. I seared and I braised. I stirred and I blended. And then we all went out for Chinese food for dinner. The next morning, Sylvia showed up. Given that Sylvia is wearing an apron and cleaning chard and the fact that I’m wearing makeup (well, I did put it on special for the picture) and hugging her, you might think that Sylvia did the bulk of the cooking on Friday. And you would be correct. 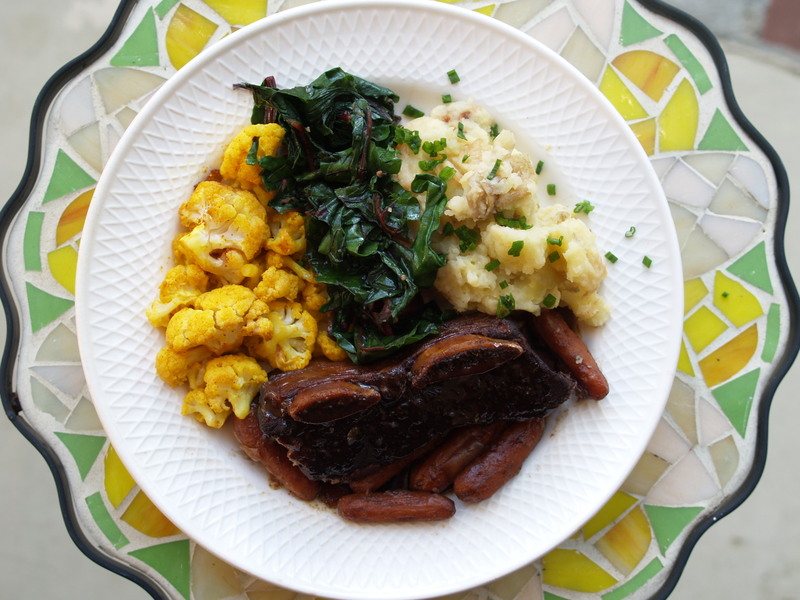 I was finishing up a project for work, and my “study breaks” included seasoning the cauliflower florets she had cut up, sauteed the chard she had washed, roasting garlic, mashing the potatoes she had cut and boiled, and observing the chicken she was breading with pretzels. I was in heaven! Before the guests arrived, Monica fretted that we wouldn’t have enough ribs to go around. The rule of thumb is one pound of ribs per person, but I had figured that 13 pounds would suffice for 15 people since a few of those people were kids. Like a good Jewish mother, Monica was concerned that someone might go home hungry. So, I made an executive decision. We were not going to serve buffet style. We were going to plate in the kitchen and serve everyone individually. You should try this because everyone thinks its fancy. And no one in the family had to hold back. This recipe is from Ana Sortun’s Spice” Flavors of the Eastern Mediterranean with just a few modifications. It serves 8, but it’s easy to modify using the formula of 1 pound of meat per person. This is one of those recipes that can be made in advance and is better the next day. I like to use a cocotte (dutch oven) with a heavy cover because you can sear and braise in the same pot. If you don’t have one, use any other ovenproof pan covered with heavy duty aluminum foil. Prep. Bring meat to room temperature. Pat dry and then season meat on all sides with salt and pepper. Preheat the oven to 350F. Roughly chop the onion and carrot, and mince the garlic. Whisk the tamarind into a cup of water and set aside. Sear. 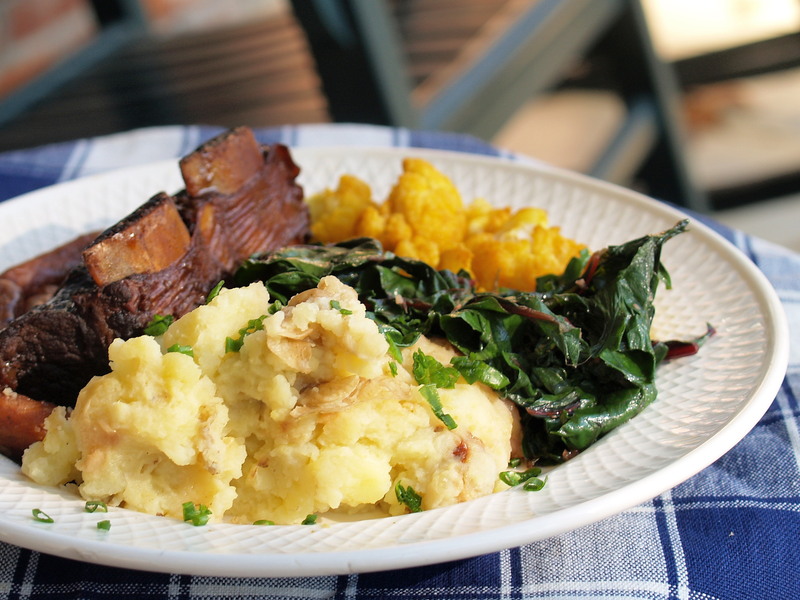 In an ovenproof pot (a dutch oven/cocotte is great), sear the seasoned meat in a tiny bit of olive oil – you don’t need to add much oil because short ribs do have a fair amount of fat. Sear the meat until there is nice caramelization on all sides. You know it’s ready when the meat shrinks away from the bone. You may need to do it in 2 batches, depending on the size of your pot. Put the seared ribs on a plate. Deglaze. Deglaze the pan with the red wine. Add the vinegar, brown sugar, and garlic and mix until the sugar dissolves. Pour the liquid into a bowl. Fill. Lay the ribs in one layer on the pot. They can be a little bit crowded. Pour the liquid mixture and the tamarind paste dissolved in water over the ribs. 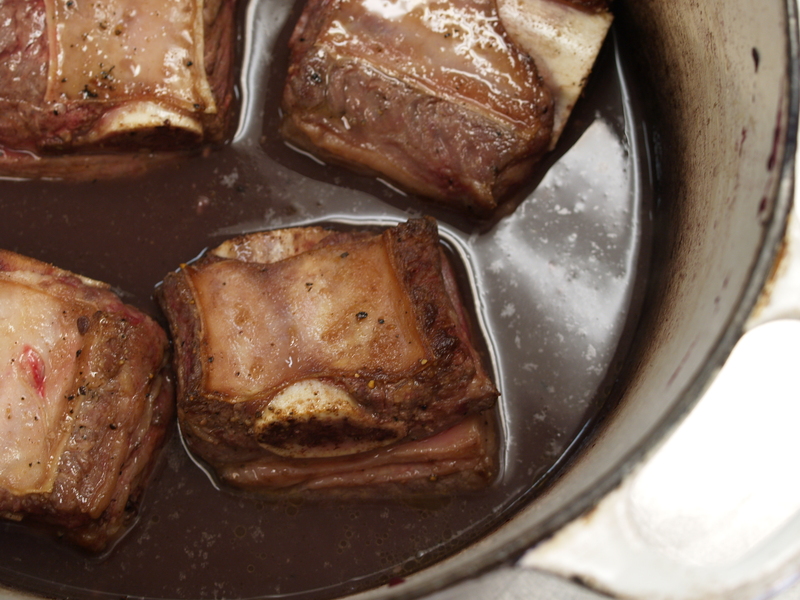 The liquid should come ¾ up the sides of the short ribs. Add more water if necessary. Cover. Cover the meat in the pot with parchment paper and then cover the entire pot with heavy duty aluminum foil. Then cover the whole thing with a heavy lid or an extra layer off foil. Essentially, you want the pot tightly closed. Braise. Place the pot in the oven and braise for 3 – 3.5 hours. You know the short ribs are ready when they fall apart when poked with a fork. Some of the bones will probably be completely separated from the meat. Strain. Use tongs to remove the meat onto a platter. Strain the liquid into a bowl. Chill. Place the bowl of liquid into the fridge for at least an hour until the fat rises to the top and completely solidifies. Boil. Boil the de-fatted liquid in a pot and then simmer until reduced by ¼. Whisk every once in a while – the sauce will thicken and glisten. Reheat. Return the short ribs to the cocotte/dutch oven. Add half the sauce and about ½ C water. Cover tightly and reheat for 20-30 minutes, rolling the ribs around in the sauce every 10 minutes. Serve. 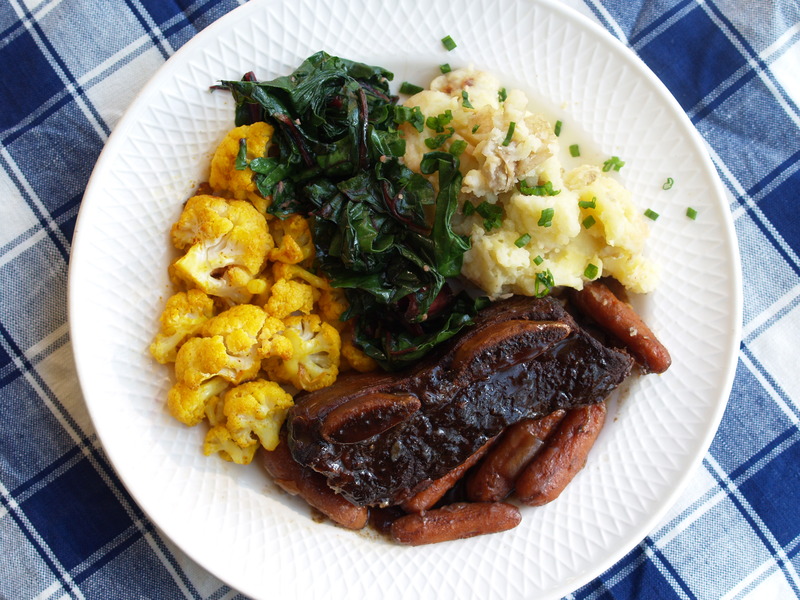 Pour a little extra warmed sauce over the ribs when you serve them with mashed potatoes, sauteed red chard, and “popcorn” cauliflower. Tamarind is a fruit in a pod. You can buy the dried pods in Indian grocery stores. Making the paste from scratch takes a while but isn’t too labor intensive – I’ve actually made it a few times. What you’re interested in is turning the sticky stuff into a concentrate. This recipe is adapted from Aromas of Aleppo: The Legendary Cuisine of Syrian Jews. Peel. With your fingers, gently crack the dried pods and pull out the sticky seeds. The seeds are linked in a chain and have a fibrous “spine” running down the length of the fruit. The “spine” comes off pretty easily – discard this along with the pod shells. Soak. In a large bowl, cover the sticky seeds with warm water. Cover and soak overnight (at least 6 hours). Strain. With your hands, mash the pulp, separating out the fibers and pits. Cut out a large piece of cheese cloth and double it up. Place it in a bowl and fill it with the pulp. You want to have a lot of extra cheese cloth around the edges. Pull the edges of the cloth together around the pulp and keep twisting to strain out as much of the pulp as possible. Soak and strain again. In a new bowl, dump the pulp that was left in the cheesecloth in more water. Again, mash up the pulp. Strain through cheesecloth again. You may need to do this a third time. Boil and simmer. Bring all of the strained liquid to a boil in a large saucepan. Lower the heat and simmer until the liquid is reduced by half. Mix in sugar and lemon juice. Boil again. Increase the heat to medium and slowly boil, stirring with a wooden spoon. The mixture will continue to reduce and eventually turn very dark brown and take on a silky consistency. Store. Once the concentrate has cooled, pour it into a glass jar. You should have about a cup. It will keep in the refrigerator for up to a year. of chopping and stirring and cooking with gas. I dragged myself up every Sunday at eight. Luck’ly they set out strong coffee to wait. but at home were dull knives that weren’t much fun. Week two was eggs that we poached, whipped, and scrambled. We made a soufflé even I could have handled. but without salt and acid, soup surely will fizzle. to make cabbage and short ribs and osso bucco. I took home a pear so the recipe I could tell. But wait! You’ve just noticed — where’s the fifth week? Oh you smart readers, nothing past you can I sneak! Week five as you know, was on hot hot hot heat. For my part, I set forth with grilling some meat. from broiling to roasting to deep deep fat fry. I’d never tried frying or grilling, no way! 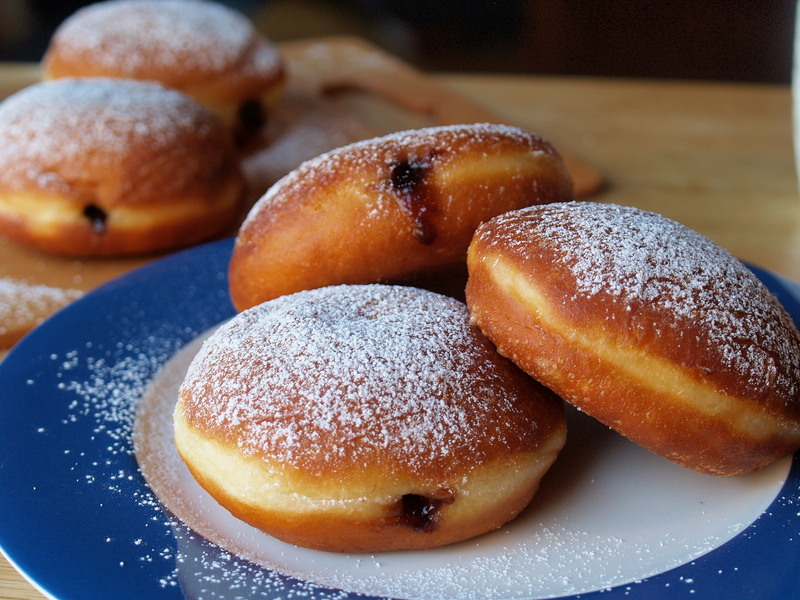 with sufganiyot – fancy doughnuts, so to speak. are jobs for a man, and I’ll flutter my lash. with a grill pan I own, or another resource. with fruit and with teacake and other sweet fare. the trash taking out will remain my worst skill. A lot of different fruits can apparently be grilled. While my cooking partner and I were waiting for our meat to marinate, we scrounged around the kitchen for other things to grill. We found pears and grapefruits and set to work. We cut the fruit into good sized chunks that wouldn’t fall down the grill grates. For the pears, we made 4 cuts around the core. For the grapefruit, we made about 4 slices perpendicular to the fruit segments. We then brushed all surfaces with a little olive oil (I’m sure melted butter would be great too), a nice sprinkle or two of sugar, and a small pinch of salt (if you want). Fire up the grill. Or, if you are like me and only have indoor cookery, put your grill pan on medium heat. When your grill (pan) is hot, place the fruit on the grill. Let it cook for about 5 minutes on each side for harder fruit (apples, pears) or 2-3 mintues per side for citrus. Just like with meat, the fruit is ready when it releases itself from the grill (pan) – if you have to tug at it, leave it be for a minute more. We made these “breads” as tea cakes in mini loaf pans. They would obviously work just as well in 2 large loaf pans. I think the cake is great as is, but excellent with the extra texture and flavor from the grill. When you make the dough – think of it like pancake batter – you don’t want to over mix. Instead you want the ingredients to just barely come together. Prep. Preheat oven to 350°F. Lightly butter/oil and flour 2 loaf pans, 6 mini loaf pans, or 2 dozen muffin tins. Toast nuts in the heated oven for 10-15 minutes – the second you start smelling the nuts, grab them from the oven. Check them at about 7 minutes. When the cool a bit, chop them up into medium sized chunks. Mix. In a large bowl, mix oil and eggs well. 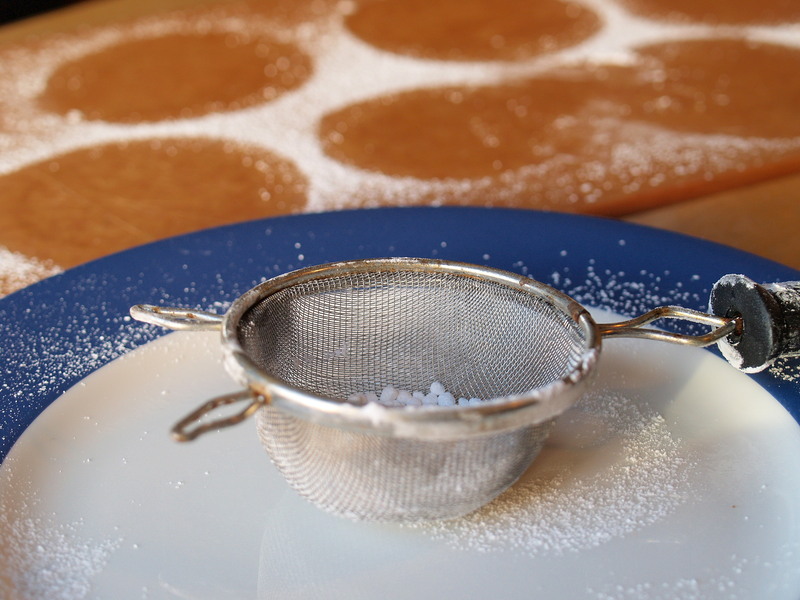 Then add the dry ingredients – flour, sugar, salt, baking powder, and baking soda. Stir this all together until it just barely combines — the mix will be a bit crumbly. Fold in nuts and cranberries. Then add juice and zinfancel and stir until just blended. Bake. Pour batter into the greased and floured pans. Bake for approximately 1 hour or until a toothpick comes out dry. Grill. Turn on your grill (or get your grill pan ready). When the bread is cool, slice it into 3/4-inch slices. 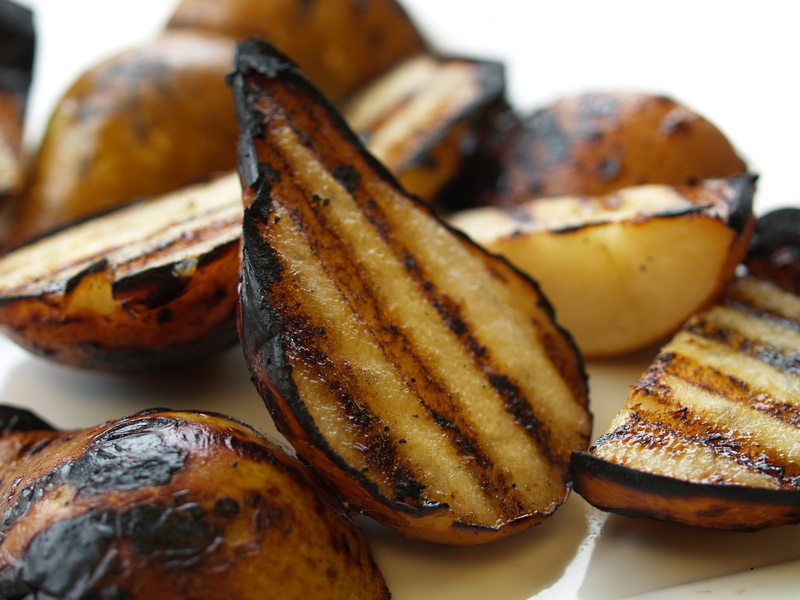 Brush with melted butter and grill slices 3-4 minutes on each side. Make mascarpone cream. In a bowl, whisk mascarpone until smooth. Add zest, orange juice, orange liqueur, and sugar and whisk until well blended. Eat. 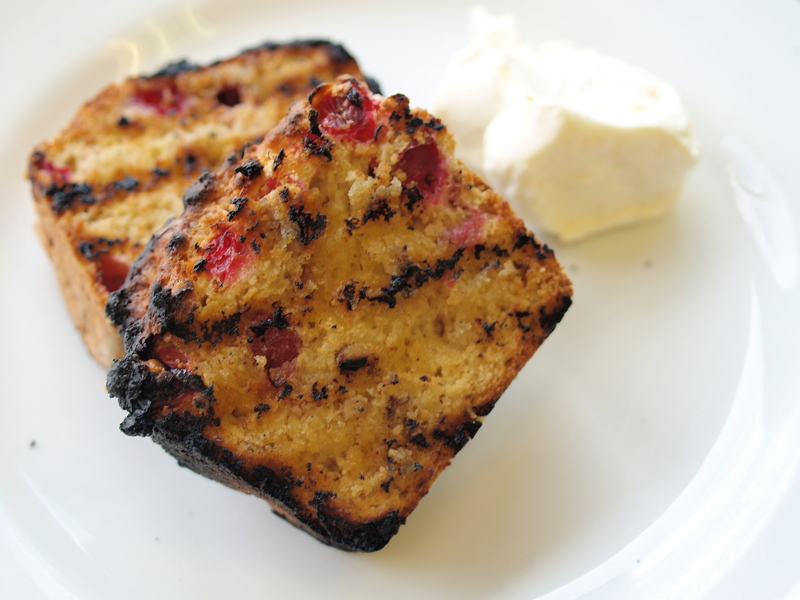 Top a grilled cake slice (or two) with a big blob of mascarpone cream. This year, I started celebrating the night before the first night. I didn’t light any candles, but I could have said a shehecheyanu — the blessing traditionally recited on the first night of Hanukkah (and other holidays) and special occasions. This was a special occasion alright. Because I fried. An Israeli friend, well-versed in the intricacies of baking and frying, emailed me his recipe for sufganiyot, and I left work a little early to pick up what we needed. A bag of flour. A bag of sugar. A dozen eggs. Yeast. And two gallons of oil. And then I rushed home to mix and knead the dough so it could rise. My friend arrived an hour later to check on the rising dough. It needed another half hour. So we turned on the football game. He watched. I poured the wine and heated up soup. We ate on the floor in front of the fireplace. One glass of wine in, I checked the dough and we were ready to roll. Literally. I sprinkled flour on the counter. He grabbed the rolling pin and set to work. The slightly soft dough yielded to the pressure, spreading out across the granite. I grabbed a glass from the cabinet and cut circles out of the dough. He gathered the scraps and re-rolled them. I cut out the circles again. He floured a pair of cookie sheets and gently lifted the rounds from the counter and slid them on to the sheets. An hour later, the flat rounds had become nice and plump, with a slight jiggle when I reached out to touch their smooth skin. The oil started to bubble in my new cocotte (thanks, mom and dad!). We dropped the first scrap in. It browned up fast with a flood of bubbles. We lowered the heat. The second and third scraps quickly browned too. We lowered the heat again. And then lowered in another scrap. It floated on the oil, staying pale and wan. We turned up the heat. With the fifth scrap came a flurry of teeny tiny bubbles and slow trickle of larger ones. The triangular scrap puffed up even more, turning golden and then coffee-with-a-touch-of-milk brown. A quick taste and we knew we were ready for the real deal. My friend scooched the first doughnut towards the edge of the cookie sheet, helping it along the way with a spatula, and slid it into the oil. A quick bob in the oil and then a float, turning golden to brown, and it was ready to be flipped. A few more minutes and it landed on the paper towel-lined countertop. Four more quickly joined. Four more and then the last few. Armed with a syringe (that a medical resident friend of mine snatched from the hospital), I pierced the side of one of the surganiyot, gently nudged the tip into the center and slowly depressed the plunger, drawing the tip backwards to the edge, leaving a trail of jam. 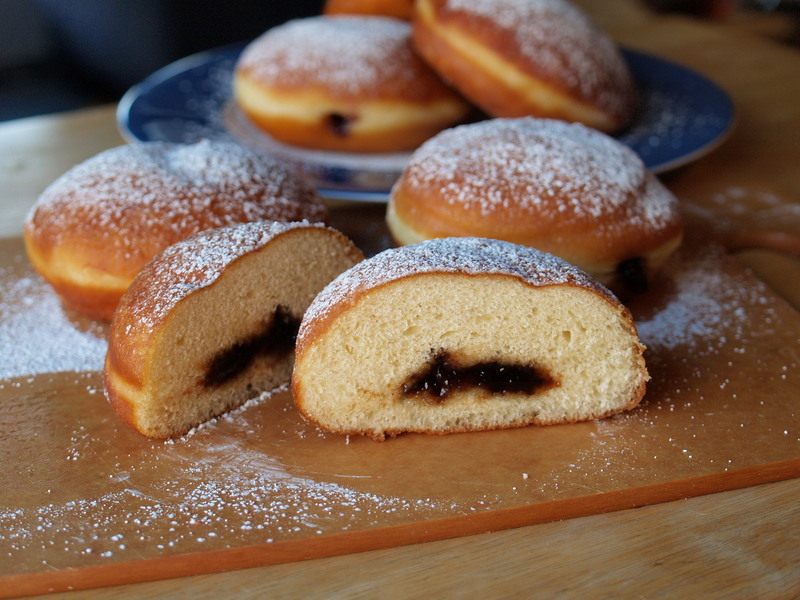 We tore open this first sufganiya and, between mouthfuls, filled the rest with jam. I showered the chubby beauties with powdered sugar. As we plucked up the sufganiyot, they left outlines behind. These doughnuts are traditionally filled with bright reddish-pink jelly though in Israel they come in all flavors. I used raspberry jam. Next time I’ll try dulce de leche. Using a drinking glass to cut the dough, we were able to make about a dozen doughnuts (but only eight made it to the office with me this morning). Proof. Mix yeast with warm water and a pinch of sugar. After about 5 minutes, it will foam up. Heat. Warm milk in a pan over low heat until it reaches body temperature. Mix. In a large bowl, mix sugar, shortening, and salt until creamy (I used my barely-functional waiting-for-the-new-one-to-arrive mixer on low speed and it hobbled along, so you could probably do just as well the old-fashioned way). Add eggs and mix. Add yeast mixture and milk and continue to mix. Add 2 cups of the flour. Beat in the remaining flour a half-cup at a time until the dough is very elastic and no longer sticks to the bowl. I had to add a total of 6 cups. Knead. Knead dough for 5-10 minutes. I started kneading in my mixer and then finished up the last few minutes by hand on a floured counter. Rise. Put dough in a greased bowl. Cover with a damp towel and let rise in a warm place until it doubles in bulk – at least an hour. I heat my oven to the lowest temperature possible (170ºF) and then turn it off and leave the covered bowl inside to rise. Knead. Once dough has doubled, knead it again briefly. Roll. Roll the dough out on a floured counter until it is about 1/2 thick. Cut. Using a drinking glass, cut the dough into rounds. Re-roll the scraps and cut the rest of the rounds. These (the rounds from the re-rolled dough) will need to rise a little bit longer than the others. Keep the remaining scraps to test the oil. Rise again. Place the rounds on a well-floured cookie sheet (ideally the kind without edges) so the dough is easier to slide right off into the oil. Let rise again until double, at least another hour. The rounds will get nice and round. Heat. Fill a really wide pot with high sides with oil and heat over low to medium heat. 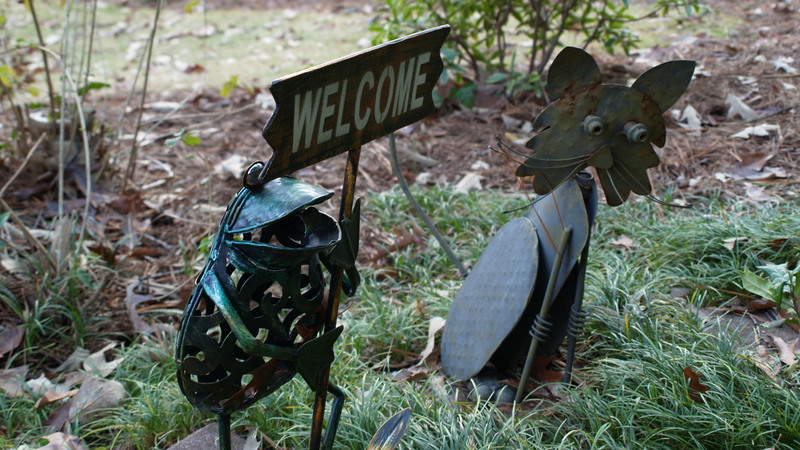 Remember those scraps left over? Gently slide one into the oil. If one side browns in 1-2 minutes, the oil is too hot. If it takes more than 5 minutes, the oil is not hot enough. You’ll probably need to test and adjust the temperature a few times. The oil is perfect when you it forms a lot of teeny tiny rolling bubbles around the dropped dough. I checked the oil temperature with a meat thermometer – it was 310ºF. Fry! Once you’ve go the oil at the right temperature, lower the cookie sheet close to the surface of the oil and scootch your first roly-poly round into the oil. Tiny bubbles should surround the doughnut. When the first side puffs up and reaches a nice brown (a bit darker than “golden”), flip it over. It took us about 3-4 minutes per side. And we made about 3-4 per batch. Drain. Cover your counter or a few plates with several layers with paper towels. 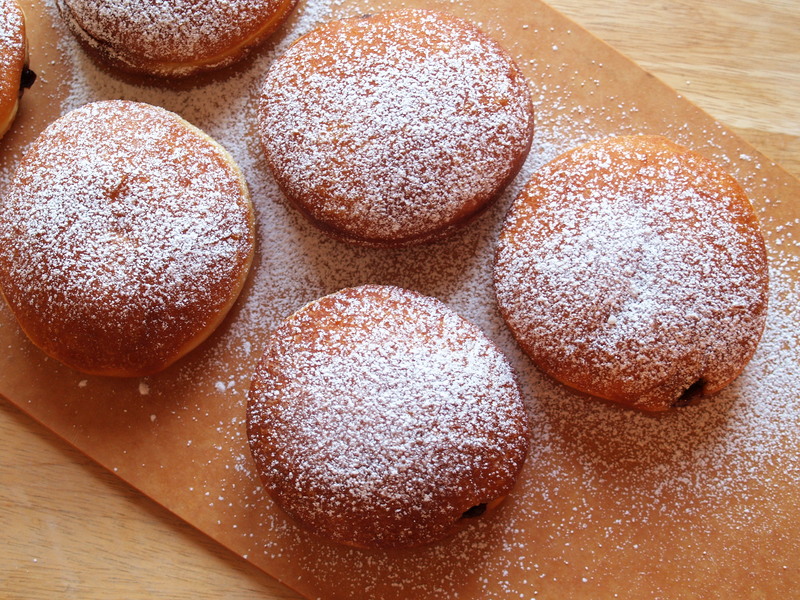 Using a slotted spoon, remove the sufganiyot from the oil onto the paper towels and drain off excess oil. Fill. Load a turkey baster (or 60cc syring if you happen to have a friend who works in a hospital and can snag one) with whatever filling you want to use. Poke it into the side of a doughnut as far as it will go. Slowly and steadily squeeze/inject the filling into the sufganiyah while gently pulling back to the edge of the doughnut. Dust. 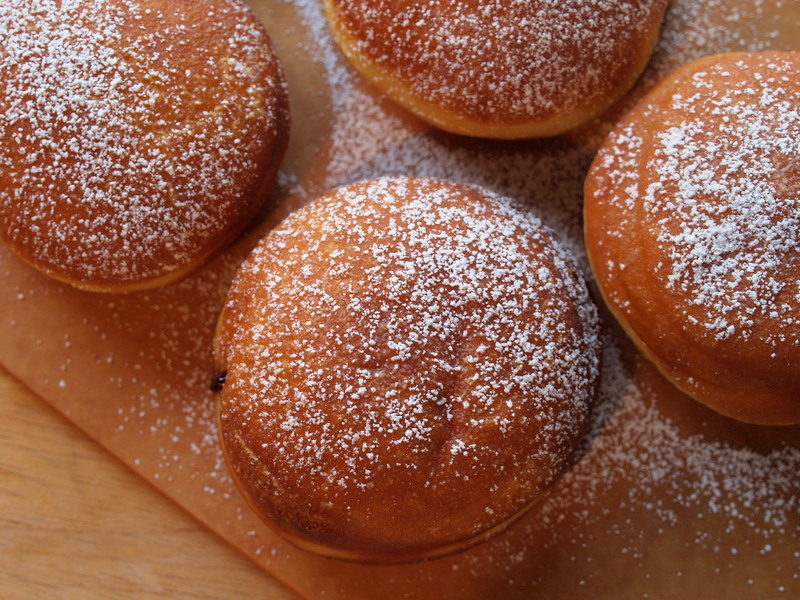 Sift confectioners sugar over the top of the sufganiyot. Eat. The sufganiyot are best fresh, but they will last about 24 hours if well wrapped. I hope you don’t mind that I got ahead of myself, sharing with you week six of my cooking techniques course before week five. But I absolutely had to get that pear recipe out to the world post-haste. As promised, here’s the missing lesson. Week five’s topic was dry heat, which includes broiling, pan-broiling, grilling, pan frying, deep fat frying, and roasting. Every surface was firing – burners, grill, fryalator, oven. Normally I position myself as close as possible to all these heat sources for extra warmth – this was an unfortunate strategy on that Sunday morning. Working at the grill, wishing I had been able to find a longer pair of tongs, I sweated it out. Having moved into a smaller kitchen for that week, there was barely enough room for us to pass one another between the work table and anywhere else. Every few minutes, there was a bump and a “sorry.” An “oh, excuse me.” Someone spilled an entire container of vinegar. And in a cooking school, the containers are big. Really big. We tentatively adopted the lingo we had heard in professional kitchens (or, let’s be honest, Top Chef), murmuring “behind” as we slid around each other, “hot” as we opened the oven door. By the end of class, we started pulling everything at once and the murmurs turned to shouts. Open the oven. Hot oven! Place a hot pan, steam rising from its roast, on the work table. Careful! 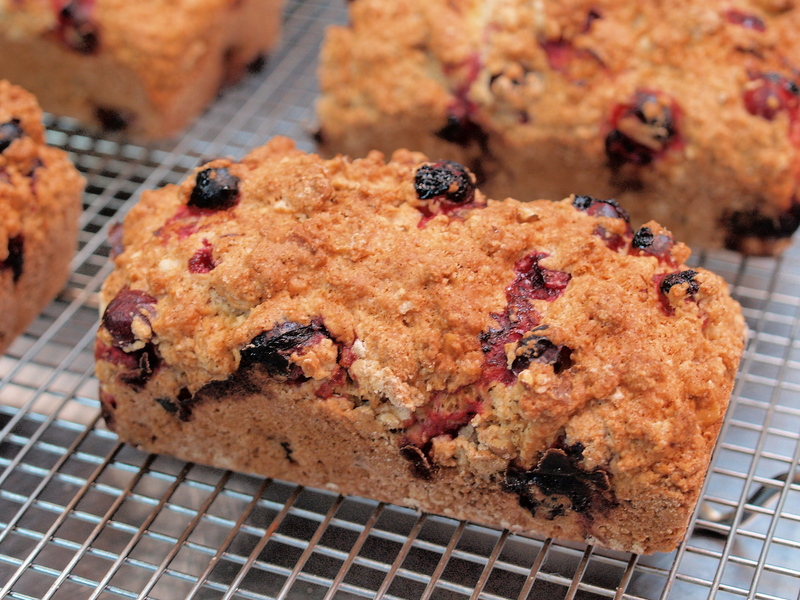 Carry a pan of cakes to the cooling rack. Behind you! Hot tray! Behind! Hot behind! – salt, pepper, extra virgin olive oil to taste. Prep. Take meat out of the fridge, and pat dry. Allow to come to room temperature while you’re making the salsa. Finely chop oregano. Make diablo salsa. There’s a lot of chopping and fine dicing here! Chop the onion very finely and then soak in cold water for a few minutes (this softens the raw taste). Quarter and seed the tomatoes. Then cut them into a 1/4 inch dice. Wearing rubber gloves, seed and finely chop the jalapeno peppers. Wash and rough chop the cilantro, removing tough stems. Combine onions (discard water), tomatoes, jalapeno, and cilantro in a big bowl. Zest and juice limes over the bowl and mix. Add salt, pepper, and oil to taste. Marinate. 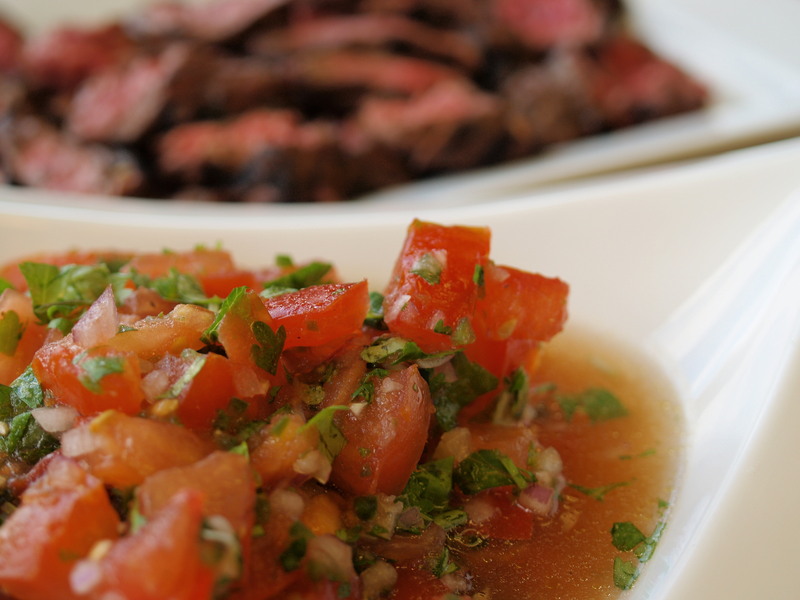 In a large bowl, mix together oil, vinegar, oregano, sugar, salt, half the salsa, and the meat. Marinate meat for 30 minutes at room temperature, or up to 4 hours in the fridge. If it’s been in the fridge, make sure to bring the meat to room temperature before grilling. Grill. Light your grill (I can’t really give you instructions on this, because I don’t have one and all we did in class was turn on the gas.) But if you live in an apartment and don’t have a grill, turn your stove to medium and heat up a cast iron grill pan. You don’t need oil on the grill/pan since the marinade contains oil. When the grill/pan is hot, remove the meat from the marinade and grill for 3-4 minutes per side — this will be nice and rare (add 1-2 minutes more if you want medium rare/medium). If the meat sticks to the grill/pan, then it’s not ready to be flipped. When you can take the meat of the grill/pan easily, it’s ready to flip. Rest. Let the meat rest for at least 10 minutes to let the juices distribute. Once you slice it, it will get cold really quickly, so wait until you’re ready to serve before slicing. Slice. Slice the meat against the grain, holding the knife at a 45º angle with the cutting board. Eat. 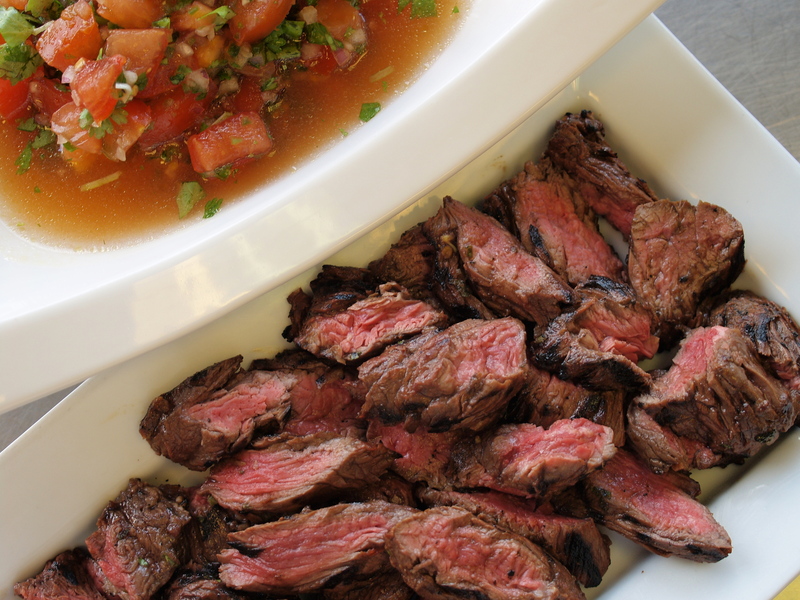 Arrange meat on your platter and serve alongside or topped with diablo salsa. Before I end this post, I wanted to pass along a few tips that our chef instructor shared with us about dry heat cooking. – With meat, like with braising, you want to first sear and then move the meat to a lower temperature. If you’re grilling, put the meat on the hot part of the grill and once you get nice grill marks and browning on both sides of the meat, move it to the cooler side of the grill and finish cooking off the inside. The thicker the meat, the further you should move it from the heat so that it doesn’t burn before it cooks. If you’re pan broiling, again sear the outside and then finish it off in the oven. – To make criss-cross grill marks, make the first set of marks and then rotate the meat and place it on another hot part of the grill. If you keep the meat (or whatever you’re grilling) in the same place, the grill will be too cool in that location and won’t make nice marks. – If your meat sticks to the pan or grill, leave it alone. When it’s ready, it will release itself from the heating surface. – Always start meat at room temperature – generally take it out of the fridge an hour before you plan to cook it. – Put salt and pepper on the meat before you sear – it will not only season the meat, but help the sear (I’m not entirely sure why that is). – When you roast meat in the oven, make sure to put it on a grate so that all sides of the meat cook evenly. – The classic way to roast a chicken is to season with salt and pepper and roast in the oven for 45 minutes to an hour in a very hot oven (450-500ºF). – When you deep fat fry, 375ºF is the optimal temperature for the oil so that it “sears” whatever you’re cooking. If the oil is not hot enough, it will just soak into the the food. If it’s too hot, it will burn. Today was the sixth and final class of my cooking techniques course. But wait, you might be asking yourself, isn’t it a six-week course? And then you’ll calculate, haven’t you only posted four classes? Finally you’ll wonder, what happened to class number five? I can’t put anything past you guys. 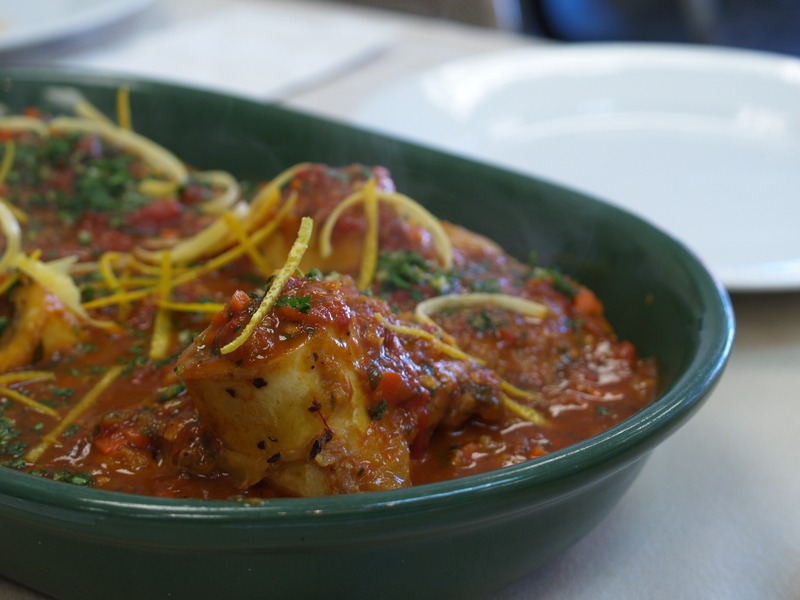 Turns out that one of the recipes that we made today in sauces class was just too good to not share immediately. I hope you don’t mind that I’ve gone out of order. I’m almost done writing up recipes from our fifth class on dry heat — grilling, broiling, roasting, frying. And eventually I’ll share more about the sauces that we made today — the five “mother” (base) sauces and several “small” (derived) sauces). But for now, let’s just get on with it. But wait, you might be asking yourself as you scroll past all this text, where are the pictures? Why is there only one? Turns out, I left my camera at home today. Ironically, as I struggled this morning to wake up, snoozing for 4 minutes and 59 seconds at a time, I dreamt (nightmared?) about driving to class, left hand on the wheel, right rifling through my purse. Two phones. Two sets of keys. One pair of sunglasses. One wallet. One lip balm. One lipstick. One eyeliner. Zero camera. Seven snoozes later, I jumped in the shower, threw on some semblance of an outfit, and swung my purse onto the passenger seat of my car. Halfway to class, I glanced over at my purse. No rifling necessary, I knew my camera was sitting alone on my desk. Both hands on the wheel, I sighed. As the class drew to a close, we filled the center of the table a with a parade of platters. 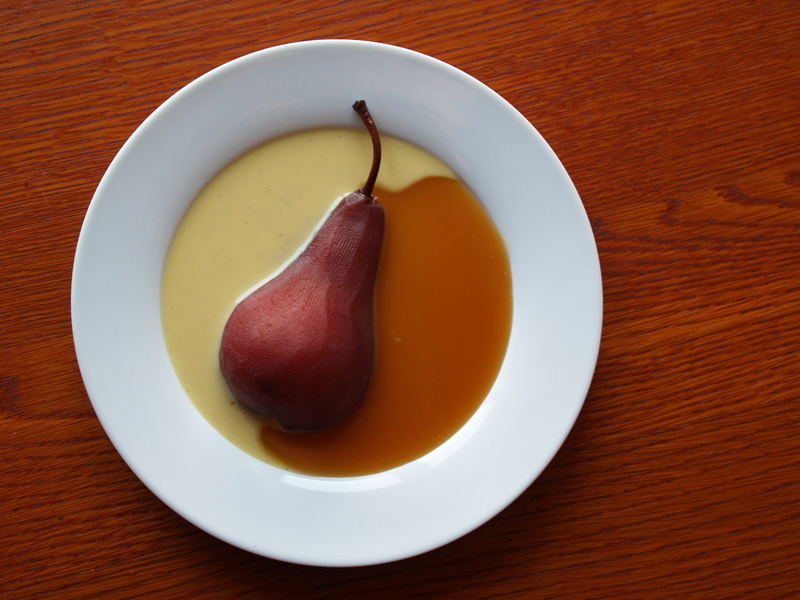 Fashionably late to the table came the belle of the ball: red-tinged pears floating on a lake of vanilla-flecked crème anglaise and drizzled with caramel. I had been watching this dish come together all morning. Peeking under the parchment at the pears. Sliding a spoon into the crème anglaise. Scraping up the last bits of caramel coating the nearly-empty pan. You know how much I love pears with red wine and caramel. The table finally set, everyone turned to me. This would make a great picture. Can you photograph my dish? Oh, how about catching it at this angle. Empty-handed, I shrugged. I forgot my camera at home, I said. I shrugged again. But maybe I can take one or two things home to photograph. If there’s anything left. I counted as one-by-one my classmates moved towards the pears. One, two, three pears onto plates. Another split between a couple. Four into little bowls. Five more onto plates. Three more swimming on the platter. Does anyone mind if I take the last few pears home? I just want to take a few pictures. Because I left my camera at home. Before I keep you from the recipe any longer, I did want to thank all of you who have voted for Kosher Camembert as the 2011 Best Kosher Food Blog.I was nominated alongside some of my favorite kosher blogs and websites and you should definitely check out the competition. Of course, if you do like my blog, please do vote, share my blog, and spread the word. This recipe can be as simple or as complex as you want it. In a healthy mood? Make only the poached pears. Red wine give you a headache? Use white wine or tea or even water instead of the red wine and adding some cinnamon (or your favorite spice) to the poaching liquid for extra flavor. Want to add a little more sweetness? Freeze the poaching liquid and make sorbet. Love vanilla? Make the crème anglaise. Love ice cream? Double the crème anglaise recipe and freeze it. Hosting a fancy dinner? Make the caramel and crème anglaise. And then invite me to dinner. A quick note on making all three recipes in parallel. I’d start by preparing the pears and while they’re poaching, start the crème anglaise. While the vanilla is steeping in the milk for the crème anglaise, finish up the pears. I wouldn’t do anything while making the caramel. For poached pears: These are generally served chilled and can actually be refrigerated for up to 2 days. Simmer. Scrape the seeds from the vanilla beans into a saucepan (large enough to fit all the pears). Add vanilla pod, wine, sugar, water, and zests and bring to a simmer. Peel. Peel, halve, and core the pears (or keep them whole). We used a melon baller to core the pears. Keep simmering. Add the pears to the simmering liquid (they should be mostly submerged in the poaching liquid), cover with parchment paper, and cook over medium-high heat until just tender – this can take anywhere from 15-45 minutes, depending on the type, ripeness, and thickness of the pears. Our Boscs were pretty firm and cut in half, and they took about 30 minutes. Chill. Chill the pears for up to a day or two in their poaching liquid. Optional: Freeze. Taste the poaching liquid – you want it to be really sweet, almost too sweet, for sorbet. Add some sugar if you want. Strain out the citrus and vanilla bean, and throw it in an ice cream maker. Or, freeze the liquid on a flat pan and then use an immersion blender to aerate. Or, do the same with crème anglaise and you’ve got vanilla ice cream. Optional: Reduce. If you want, reduce the liquid down to a syrup and strain out the citrus and vanilla bean. For caramel sauce: You do have to watch caramel very closely because it can burn. More importantly, it can burn you. When you add the butter and cream, it will bubble up violently and can splatter. So use a long whisk. Very long. Also, you can use different liquids; for example, you can replace the water with red wine or lavender water. To make lavender water, heat water with dried lavender buds and let infuse for a few hours (or longer) and strain before using. Heat and stir. In a large (2-3 quart, with high sides) heavy bottomed saucepan, heat sugar, water and a few drops of lemon juice over medium heat. Stir occasionally until sugar is dissolved (a “simple syrup“). Stop stirring. Once sugar mixture comes to a boil, stop stirring. Boil. Boil mixture, swirling pan as needed until a caramel forms – should be a dark golden brown. Remember, don’t stir. Be careful. Immediately add the butter to the pan and whisk until melted. The mix will foam up. Once the butter is melted, take the pan off the heat, pause for a few seconds, and then add cream, whisking until smooth. The mix will foam up now too. Once everything is whisked together, you’re done. Add a few pinches of salt. Keep warm over very low heat until you’re ready to serve. For crème anglaise: Crème anglaise is a cold sauce that’s the base for ice cream. It’s also called English or stirred custard. Scald. Scrape the seeds from the vanilla bean into a saucepan with milk, and add vanilla bean pod as well. Scald the milk. The milk is scalded when you put your finger in it and it’s hot (not burning). Steep. Take the milk off the heat and let the vanilla bean steep for 30-60 hours. Whisk. Lightly whisk the egg yolks. Gradually add the sugar and a pinch of salt, and keep whisking until you get a pale yellow sauce that forms ribbons when dropped from a spoon. Pour and stir. Remove vanilla pod from the cooled milk and slowly pour it in a steady stream into the egg yolks and sugar, while stirring. Heat and stir. Place the mixture over medium heat and keep stirring constantly until the mixture is smooth and coats the back of the wooden spoon. DO NOT BOIL – temperature should not exceed 180ºF. Strain. Strain through a fine mesh seive into a bowl set over an ice water bath. How was your Thanksgiving? Are you all turkeyed out? After our dinner (do you call it dinner when you start eating at 4:30? ), I made stock from our carcass – it’s nice and jiggly and nestled in the freezer, waiting for a starring role in my next soup. I’m a little behind in updating you on my cooking techniques course, so get ready because here we go. 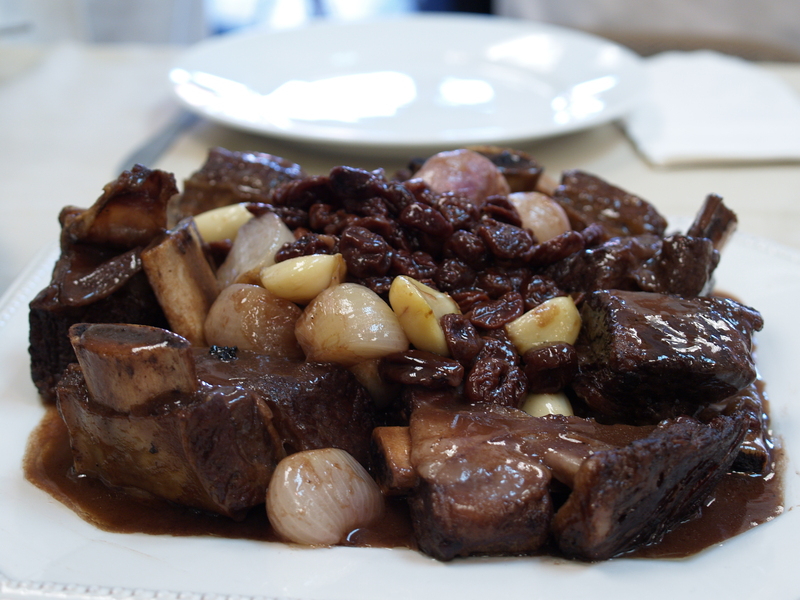 After knives and eggs and soups, we braised. The only rule in braising is to go low and slow. With a little (a lot of) patience, even the toughest cuts of meat end up spoon tender. In my former life as a medical student, the mantra “low and slow” referred to correcting a patient’s sodium when you’re in the hospital — too fast and you risk central nerve damage and lots of bad stuff. Good thing I left that world…these days if (when?) I’m impatient, I just end up with tough meat. 1) Sear the meat in a big cast iron pot (like an enamel-coated dutch oven, or, in French, a cocotte) – this seals the juices inside. 2) Deglaze – after taking the seared meat out, scrape up all the good stuff with liquid (wine, stock, etc.). 3) Add the meat back to the pot with the liquid and the “fond de braise” – aromatics (usually mirepoix vegetables, i.e., onion, celery, carrot) and herbs. 4) “Swiss” with tomato paste – swissing is a fancy way to say tenderizing, and the acid in tomato paste helps break down the meat. 5) Cover the pot tightly with “the inverted lid of foil” – in case you’ve never heard that term (I sure hadn’t), you first lay a large sheet of parchment directly on the food, letting the ends drape over the edges of the pot. Then put a large sheet of aluminum foil right on top of the parchment, again draping the ends over the edges. Then place a heavy lid over the layers of parchment and foil. Be sure not to place the foil directly on the food because it will galvanize (forget the science…the foil corrodes onto the food…not so appetizing). 6) Braise in a low set at 300°F – 325°F (you can also braise on low heat on the stove top, but using the oven allows for more even heating). 7) The meat is ready when it slides easily off a wooden skewer or toothpick; if it sticks, it’s not ready yet. 8 ) If you are thickening liquid for gravy by adding flour, make sure to boil the mixture so that the flour can expand, resulting in a smooth gravy. Well, lesson done, let’s get on to the recipes Four recipes in fact. 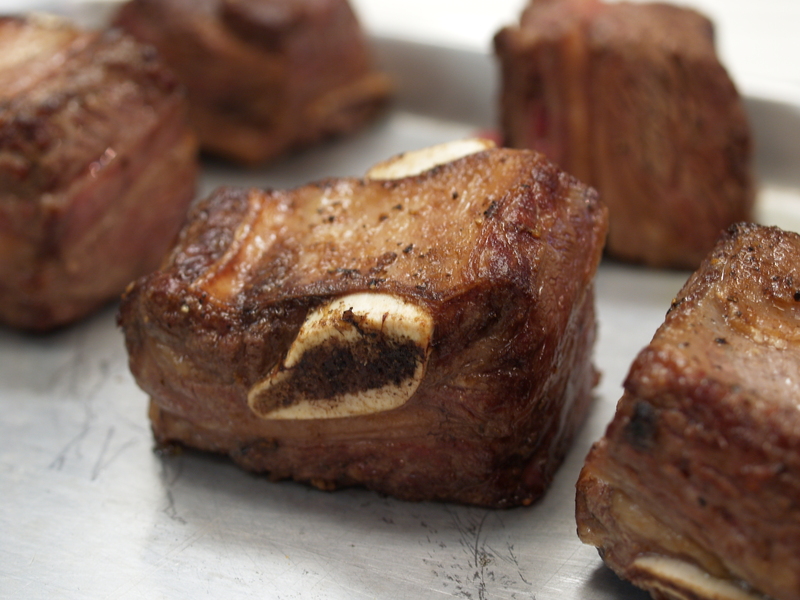 Short ribs. 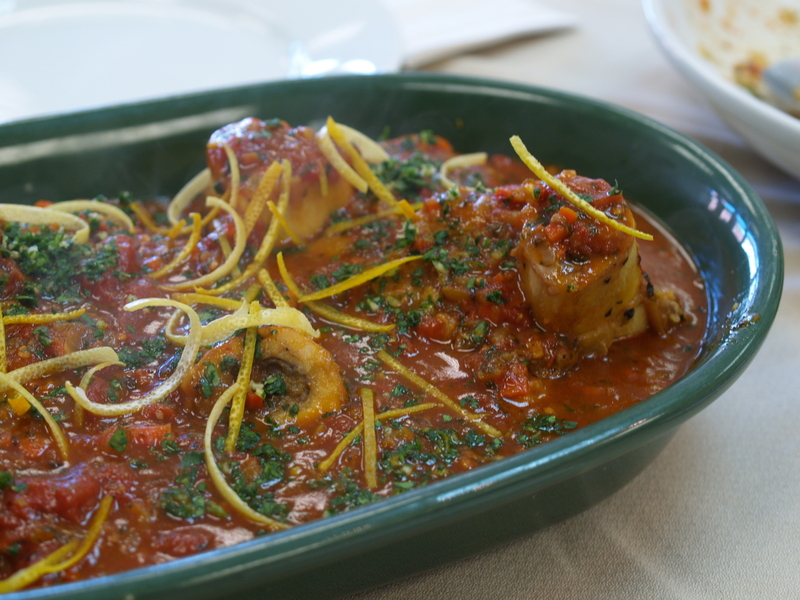 Ossobucco. Sea bass with fennel. And cabbage. Cabbage? you ask. Yes, cabbage. You’ll see. Prep. Preheat oven to 325ºF. Bring ribs to room temperature and season with salt and pepper on all sides. Peel garlic and shallots. Sear. Heat oil in a cocotte over medium-high heat. In batches, sear the seasoned ribs on all sides. Remove meat and pour remaining oil out of the cocotte. Deglaze. Add wine to the cocotte and scrape up all the browned bits with a wooden spoon, Don’t forget the sides of the pot. Reduce wine by a half down to 3/4 C.
Thicken. Add flour to the wine and stir to make a paste. Then add stock and bring to a boil, whisking until smooth. Braise. Add ribs, meat side down into the pot. Cover with an inverted lid of foil (i.e., parchment and foil, as above) and then the pot cover. Bring to a simmer and then transfer to oven. Cook for 1 1/2 hours. Add more stuff. Add salt, garlic cloves, and shallots, cover, and return to the oven. Cook for another 1/2 hour or so. Add a bit more stuff. Add the cherries, partially cover (you can remove the inverted lid of foil and just use the pot’s cover), and braise another 15-20 minutes until a skewer inserted into the meat comes out with no resistance. Serve. Arrange ribs on a plate. Strain the liquid and reduce it to concentrate the flavors if you’d like (we didn’t because we ran out of time). Cover the ribs with cherries, garlic, and shallots. Use a turkey baster to draw liquid from the bottom (leaving the layer of fat on the top) and drizzle the liquid over the top. Prep. Heat oven to 325ºF. Finely chop the carrot and onion. Mince the garlic. Finely chop the parsley leaves. Remove a wide, thin strip of orange rind. For the garnish, remove rind from 1 oranges and 1 lemon and julienne. There should be no bitter white pith on the rinds. Sear. Lightly flour the veal shanks. Heat 3 T olive oil (or enough to cover the bottom of the pot) and brown the shanks on all sides. Remove the shanks and pour off any remaining oil. Saute. Return pot to stove, cover bottom with the remaining 3 T oil. Saute the carrot and onion until soft. Add garlic and cook 1-2 more minutes (garlic can burn easily, so don’t add it until the end). Deglaze. Add wine, scrape up the good stuff, and boil over high heat until reduced by half. Add tomatoes, slice of orange rind, saffron, basil, chopped parsley, and stock. Season with salt and pepper, and then return shanks to the pot. Braise. Cover pot with an inverted lid of foil (including the parchment first, as above) and lid, and braise for 1 – 1 1/2 hours until skewer slides out of the meat easily. Make gremolata. Finely chop garlic, parsley, and anchovy (or use anchovy paste). Zest half the lemon. Mix garlic, parsley, anchovy, and lemon zest. Serve. Remove the shanks for the liquid and place in a shallow bowl. Reduce the cooking juices until thickened. Add half the gremolata and simmer for a minute. Pour reduced juices over the shanks. Sprinkle with remaining gremolata and with citrus julienne rinds. Don’t forget to dig into the marrow. I am an anti-licorice kinda gal. I don’t like tarragon, strong basil, arak, or fennel. That said, this is the second fennel recipe that I’ve discovered that I actually like. Braising the fennel sweetens the bulb and removes some of that anise flavor. Prep. Preheat oven to 450ºF. Cut fronds (the green dill-looking ends) and stalks off of bulb. Throw out stalks. Quarter fennel bulbs lengthwise and cut into 1/4 inch slices. Chop fennel fronds until you have about 2T (these will be for garnish). Cut the onion two different ways (you’ll be using it in two different parts of the dish: cut half into 1/4-inch slices, and finely chop the other half. Ideally, buy the fish already skinned. 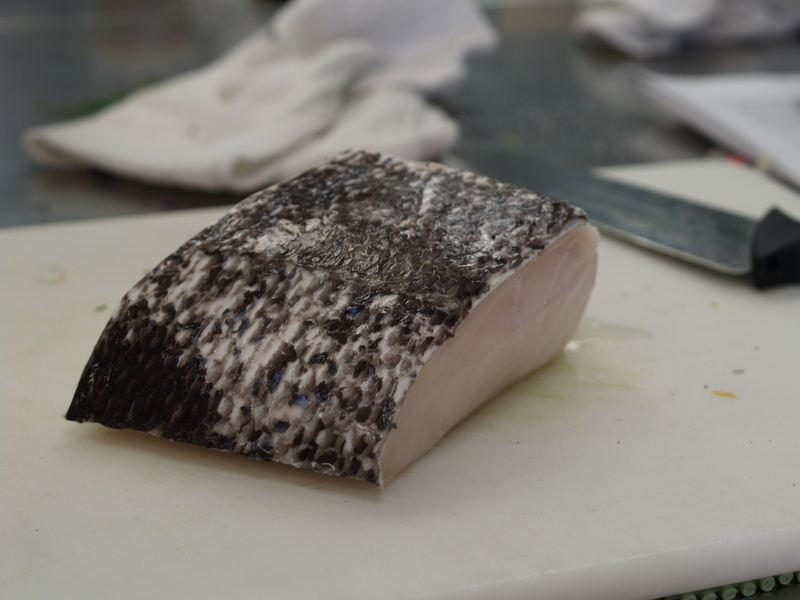 If you buy it with the skin and want to do it the hard way, place the fish skin-side down on a cutting board, slide a filleting knife (very thin and flexible) just above the skin and peel off a skin tag long enough to grasp. Hold on to the skin and slide your knife between the skin and flesh at a 45° angle to the board, almost scraping off the skin. Maintain the tension to help separate the planes. I wish you good luck – I’m not brave enough to try it! Braise. In a skillet, stir fennel and onion slices and anchovy paste in 2 T oil over moderate heat for about 1 minute. Season with salt and pepper, add broth, and braise covered until vegetables are covered, about 20 minutes. Stir occasionally. Uncover and boil. When the fennel is tender, uncover and bring to a boil, stirring occasionally until liquid has evaporated — about 10 more minutes. Transfer fennel mixture to a shallow baking dish (ceramic or glass). Saute in parallel. While the fennel is braising, cook the chopped onion, red pepper flakes, and salt with remaining 2T oil in another skillet over moderate heat. Stir occasionally and cook until onion softens, about 10 minutes. Add tomatoes and simmer, stirring occasionally, until very thick. This should take another 10-15 minutes. Bake. 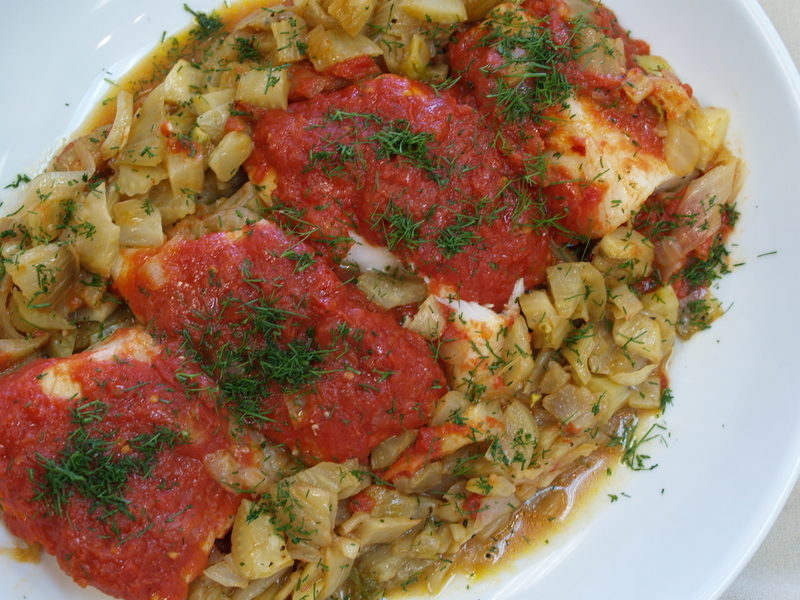 Arrange fish fillets on top of the fennel mixture in baking dish. Spoon tomato sauce over fish. Cover with a sheet of parchment paper, and then cover baking dish tightly with foil. Bake until fish is just cooked through (falls off a skewer) – about 20-25 minutes. Garnish with fennel fronds. Prep. Quarter, core, and shred the cabbage. Julienne the onions. Cook. Melt butter over medium heat and cook onions until golden brown, about 12-15 minutes. Braise. 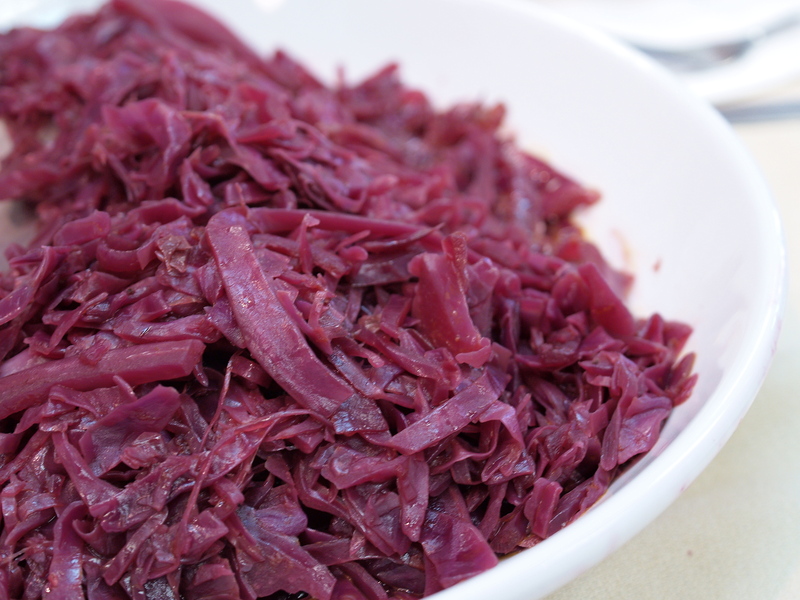 Stir in cabbage, wine, sugar, orange juice, and salt and pepper to taste. Simmer covered, stirring occasionally, until tender – about 45-60 minutes. Season with salt and pepper.